Home › Blog › Featured articles › Do you Make These 3 Canal Boat Summer Holiday Mistakes? If you’re planning your first ever narrowboat summer holiday this year then there could be three common mistakes that you don’t even know you’re making. The experienced boater knows the answers to these three questions: Get rid of holiday doubt and uncertainty once and for all with our three top tips for a trouble-free summer cruise. 1) What if it Rains? Choosing an English canal boat holiday means that you must embrace the great British weather – this is where taking your holiday-home with you as you travel gives you unrivalled creature comforts! Should it be raining or windy or both, your options are to moor up until it all blows over, or carry on regardless with an umbrella, some team spirit and an extra helping of optimism. Depending on where you are when the bad weather strikes you might moor at a pub, or explore a local village or town. If you’re in the middle of some glorious piece of nowhere, enjoy the feeling of being isolated in nature, while grabbing a snack, playing cards or board games, reading a book or drawing and painting. Our hire boats also have a stereo and a flat screen TV with Freeview so you won’t be bored! Anyway, there’s no need to rush to reach your destination. Canal boating is all about enjoying the moment! 2) Where Should we go? To find out how long your journey will take you, try using CanalPlanAC, an online tool for planning your route, taking into account distances and locks. This website has an extensive collection of beautiful waterway photographs and shows pubs and shops along the way. The default calculations are based on seven hours travelling each day, and on all days being the same length, but for a more relaxed holiday you might want to plan on travelling for about four hours per day, so that you have time to explore upon land from time to time. The website allows you to change the default options to plan your own ideal journey. 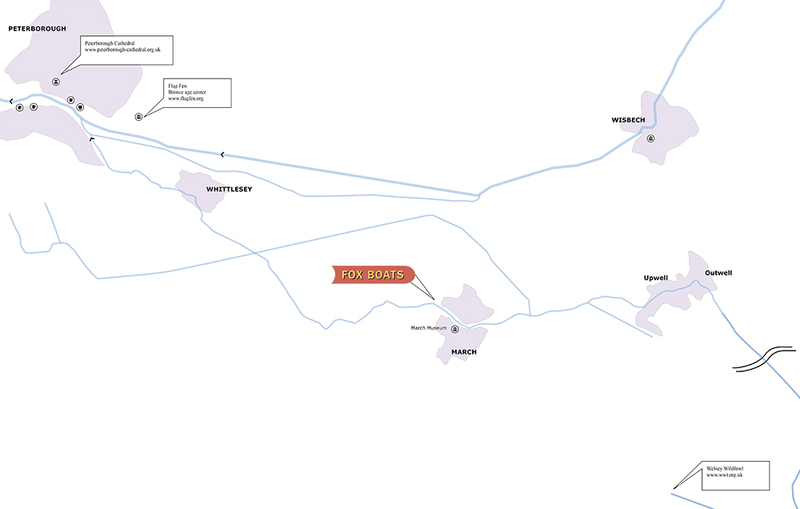 The Fox Waterways Route Guide will also steer you through different boating journeys, showing the highlights of the Fenland waterways and places to visit. 3) What if it’s Busy? School holidays can be a busy time on England’s canals (that’s late July to early September) but busy just means that occasionally you might have to wait to use a lock, or the best mooring places (e.g closest to the pub) may be taken when you arrive. That’s why choosing the Fenland waterways can be a good option; they offer a much less crowded alternative to the Norfolk Broads. However, remember a busy area on a canal is nothing like the misery of being stuck in a traffic jam on the road! Queuing for a lock can mean chatting to other boaters, or just relaxing on your back deck with a cup of tea. Check availability here: Search hire boats and dates. Adam Henson (BBC’s Countryfile) described the Fenland waterways as a “hidden gem”. If you are looking for an admirable hiding-place to get away from it all and lose yourself in a network of navigations then this is the holiday you are looking for!